This church started in a schoolhouse in Annawan in 1853. It eventually progressed to three protestant denominations and then to their union in 1917. The present building was built in 1924 at a cost of $20,000. 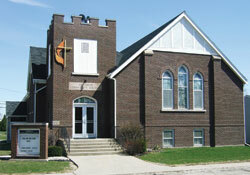 The church was named the Annawan Community Church and was dedicated on December 7, 1924. On December 8, 1974 the church celebrated its 50th anniversary with Dr. Simms, the assistant to the Bishop, rededicating the church building. Rev. Dan Wright is the current pastor. Fairview Church is located three miles south of Annawan. The merger of the Evangelical and United Brethren Churches was in 1953, thus the name was changed to Fairview Evangelical United Brethren Church. In 1956 a new brick building was built west of the church. Another name change occurred in 1968 when the EUB Church and the Methodist merged, and the church became the Fairview United Methodist Church. Many changes have been made to the church such as the north entrance being removed, the sanctuary was reversed from north to south and a new entrance was placed on the west with a carport. Rev. Dan Wright is the current pastor. In 1960 Father Benedict Schlimm was appointed pastor of Sacred Heart. 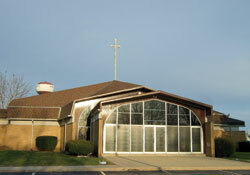 He began a major renovation of the parish facilities. The first task was the building of a new one-story brick rectory at a cost of $40,000 that was completed in 1962. The next project would be a large parish hall built east of the existing school connected by a large enclosed corridor and restrooms. The work began in the fall of 1963 with the first large parish event being held in the hall on November 1963. On August 9, 1966 it was voted to begin planning for a new church to be built west of the new rectory. In March of 1970 the contract was let for the building and work began almost immediately. The roof, when viewed from above, looks like a cross. 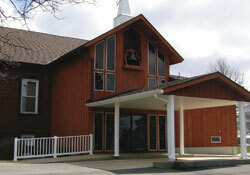 The first mass was held in the new building on Wednesday evening, March 31, 1971. Father Stephen Engelbrecht is the current pastor.